Since I wrote this piece, just a week ago, fires have ravaged through the fynbos (the beautiful flora and bush which is unique to the Cape). Many of the animals are able to bury themselves below the surface and survive. Botanists are delighted that rare species will be regenerated by the fire. They tell us it needs to blaze at least every ten to fifteen years for some of the plants to germinate and grow. The emergency services and fire volunteers were magnificent. People have come together through the dramatic events which unfolded. Chapman’s Peak is now closed to the public, and may be for some time. The whole scenic drive about which I wrote, was an inferno. The toll booths were destroyed, the fynbos turned to a ghostly cinder. Thankfully the wind died and the rain came. 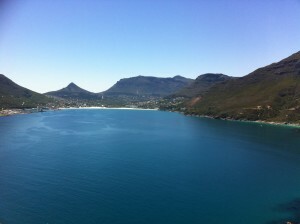 Here is my blog about Chapman’s Peak. I’m looking forward to the day when I can drive it again, and be uplifted by it’s sheer beauty. As I drive along Chapman’s Peak in my new car, I sit up high in the large 4×4 and slow down to take in the natural beauty that surrounds me. I shall never tire of the ever changing scenery. Capetonians sometimes complain about the cost of crossing ‘Chappies’, but for the price of a cup of coffee in London, I can enjoy this breathtaking view, which shifts according to the weather, the time of day and the season. I must have driven this road at least a hundred times. On a summer’s afternoon the intensity of the light picks out every crag, every nuance of the rock standing solid against a cloudless sky and above deep blue waters. In the early evening, the sea turn milky as the sun sinks low. Winter brings ominous clouds which obscure the light and create a monotone shadowland. In spring, the wild flowers of the Fynbos fight against the southeaster wind. Night time brings the silver moon, shining upon the watery deep, while stars sparkle bright above thin banks of dark cloud. There are days when the ocean is a mixture of translucent turquoise, emerald and jade. The clear waters look inviting with their fringe of white foam… until you dip your toe in, and recoil in shock. This is The Atlantic, the other side of the antarctic. Pure and clear – and icy cold. “The steering is even more heavy now my suitcase is weighing me down. I heave the wheel around and move off. I have no idea where I’m going, but decide to head over the mountain. I take a wrong turn. I’m lost and I’ve only just left the hostel. I decide to go into a meditative state of innocence so that I don’t panic. I keep driving through a maze of tiny residential streets in the hope I’m heading in the right direction, and not into one of the dangerous areas I’ve been warned against. The suburb is smart. I’m perfectly safe. I spot the sea and head for it. I catch sight of Ashanti Lodge. I’ve driven around in a massive circle. “I’ll go via Seapoint”, I tell myself. “I prefer that way, anyway.” I still don’t know where I’m going, but decide that if I hug the ocean I’ll get there. The winding coastal road heads out of town, beyond Camp’s Bay, which is on the edge of my comfort zone. The houses give way to mountain and sea. I’m in the unknown. It’s beautiful but I’m too anxious to appreciate it. I wonder if the car is up to it. I can smell petrol. Having reached and negotiated Hout Bay without incident, I come to Chapman’s Peak Drive – a vertical cliff-edge with a pass that winds precariously around. Luckily the pass is open. I queue and pay the toll. I hope the steering is ok on the car. There’s no air conditioning and I’m sweating. I make it to the other end and just as I see a magnificent stretch of sand, Bronwyn calls and gives me vague directions. “That’s Noordhoek Beach” she says “If you look beyond, you’ll see a lighthouse. That’s Kommetjie”. Miraculously I find the old thatched house where she is staying with her mother. I breathe. I have a cup of tea and a biscuit (having checked there is no sign of egg). “It’s a very different energy here”, says Bronwyn, “England is the young mother – gentle, deferential, soft. South Africa is the old crone. Harsh, direct sometimes, but full of ancient wisdom”. I feel settled, relaxed and grounded… and then I realise I must visit the total strangers with the allergy kid. I don’t want to go… but I remember that just as you face a demon and push yourself through another threshold, a delightful treasure awaits. The strangers turn out to be very welcoming. She is from London, her husband from Iceland. The house is painted white throughout – inside and out. Their daughter has drawn me a picture of Primrose Hill so that I don’t feel homesick. They feed me lamb shanks and show me around Kommetjie. They tell me where to shop, how to get to the beach, which cafe is the best and where to have a light lunch. We go to see her friend’s house and I fall in love with it. White throughout, open plan, big windows with plenty of light, three bedrooms, garden, garage, wifi, and five minutes walk from the beach. Magic. It’s mine for the week and probably longer if I want it. They generously offer it to me for a third of the going rate. Miracle. I walk along the semi-deserted stretch of fine white sand and dip my toes into the ice cold Atlantic. I mentally enter an expanded space of no-thing – no thought – no mind – no sense of time. I’m fully present in a meditative way. This is bliss. Luxury. Thank goodness I took the leap of faith and had the courage to follow my intuition. I must remember the lesson. I unpack the yoga mat and put on my yoga kit. Tomorrow I may even do some yoga. Emma comes for tea. “Why haven’t you unpacked yet?” she asks. I feel stupid telling her I haven’t had time. I’ve been too busy meditating and lying on the sofa with a smile on my face, listening to the wind. Boy it’s windy. But the wind stops tomorrow, the gardner told me… and it will be hot. I settle down in the evening and make myself a bacon, lettuce and tomato sandwich. It’s an open plan house. The smell of bacon makes its way to the top of the house. How on earth am I going to sleep?